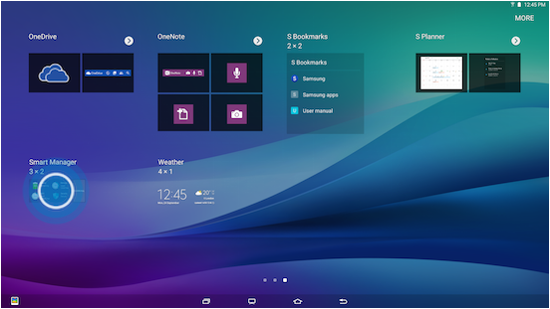 Galaxy View: What is Smart Manager, and how do I use it on my Samsung Galaxy View? 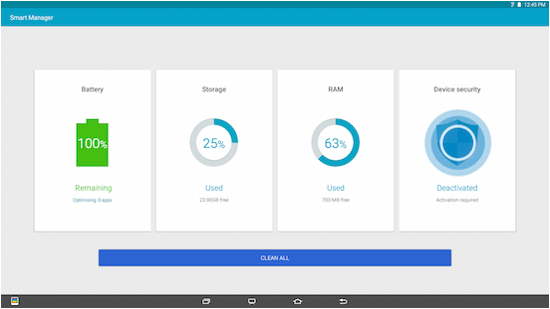 The Smart Manager application lets you manage your device's battery life, storage, RAM usage, and security all in one place. Smart Manager functions are available through both a widget and an application. • Battery: View the percentage of battery power remaining and turn on the power saving mode. 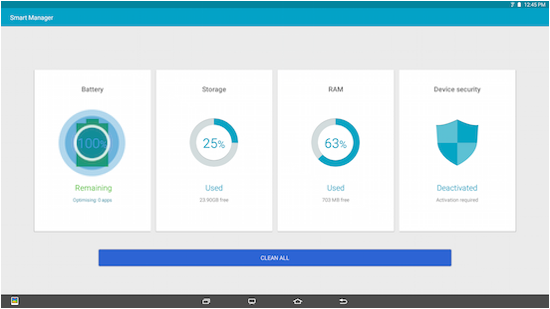 • Storage: View information about your device's system storage, and delete unnecessary data stored on your device. • RAM: View the percentage of RAM (Random Access Memory) remaining, and close applications that are currently using RAM. • Device security: View information about your device's security status and unauthorized system changes. 4. 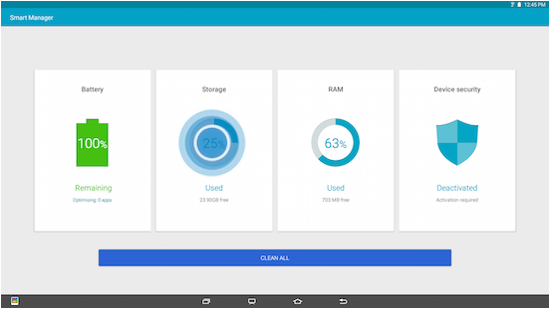 Touch CLEAN ALL to quickly clear the RAM status and delete Unnecessary data stored on your device. 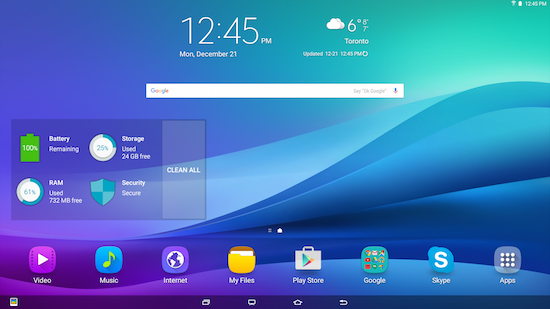 If the widget does not display on any of your Home screens, you can add it by following the steps below. 2. Swipe to the Smart Manager widget. 3. 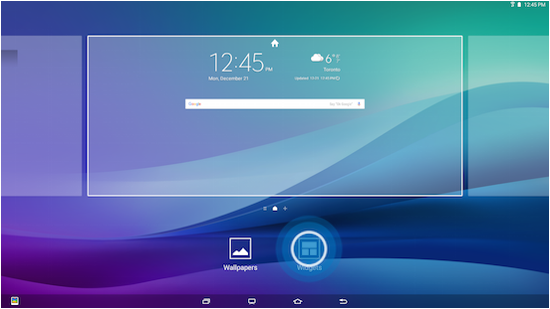 Touch and hold the Smart Manager widget, position it on an available screen, and release it. 1. Open either the Smart Manager widget or application using the instructions in the Access the Smart Manager section above. 2. Touch Battery in the Smart Manager application or widget. 3. The Battery screen displays the percentage of battery power remaining and how long you might expect that power to last. 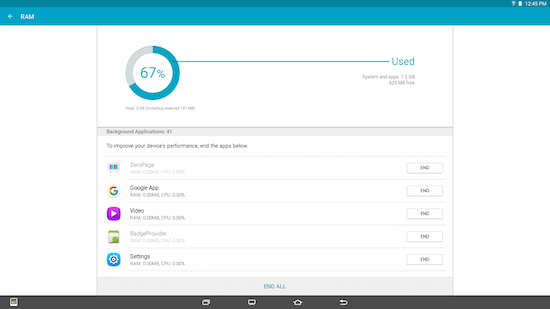 Touch BATTERY USAGE to see which processes have been running since your device was last fully charged. 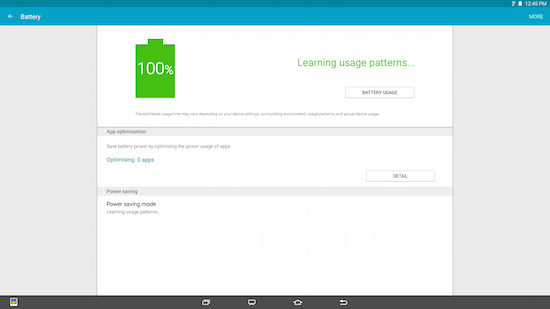 Touch Power saving mode to set your device to conserve battery power. Touch DETAIL to view applications that have used an abnormal amount of battery power while the screen has been turned off. 2. 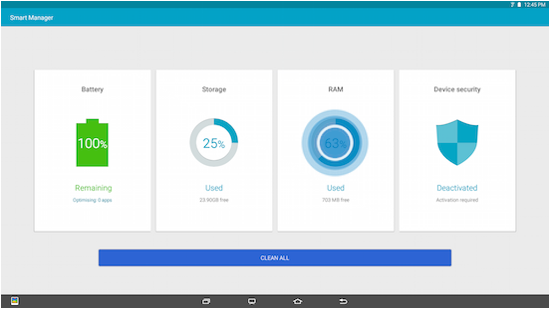 Touch Storage in the Smart Manager widget or application. 3. Review the information about your device's used and available system storage. 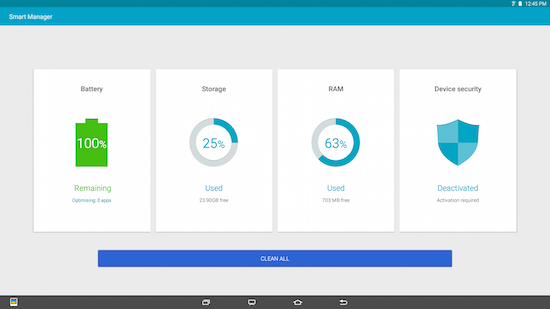 Touch DELETE to delete Unnecessary data stored on your device. Touch DETAIL under User data to view and delete unused files and applications on your device. 4. Touch DETAIL next to the chart for a more detailed breakdown of your device's Total space, Available space, System memory, Used space, Cached data, and Miscellaneous files. 1. Open the Smart Manager widget or application using the instructions in the Access the Smart Manager section above. 2. 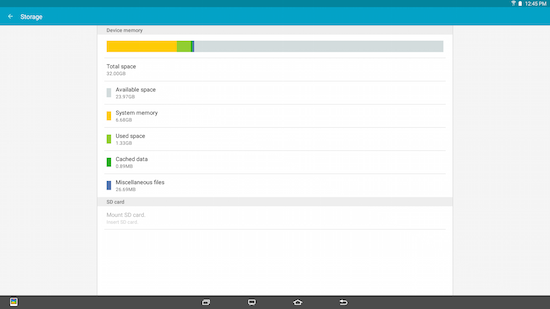 Touch RAM in the Smart Manager widget or application. 3. The RAM screen displays the percentage of RAM remaining and which Background apps are currently using RAM. Touch END to close a single application, or touch END ALL to close all running applications. You should save any information you might need before closing each application. 2. 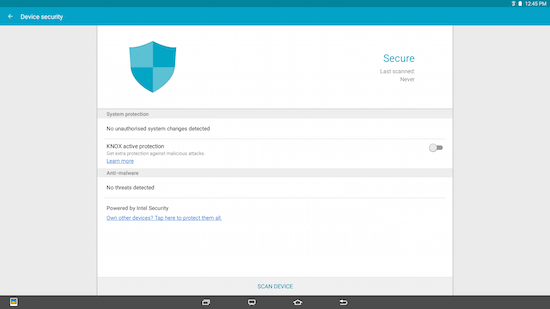 Touch Device security in the Smart Manager widget or application. 3. Read the Terms and Conditions, then touch Agree. 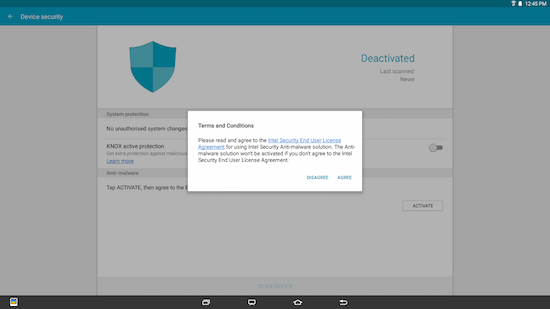 4. Review the information about your device's security status and any unauthorized system changes. If desired, touch the slider to turn KNOX active protection on . 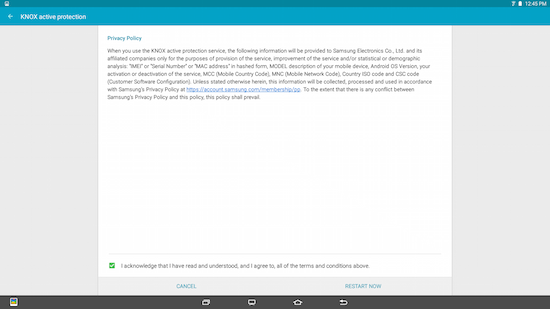 5. Review the terms and conditions, mark the checkbox to agree, and touch RESTART NOW to restart your device with KNOX active protection running.